James Watt was the father of the industrial revolution; an inventor, engineer and scientist. His crucial role in transforming our world from one based on agriculture to one based on engineering and technology is recognized in the unit of power: the watt. • radically improved the steam engine, starting the industrial revolution. • continued to produce a stream of new ideas and inventions, which eventually resulted in an engine requiring 80% less fuel than earlier engines. • invented high pressure steam engines capable of even higher efficiencies, but the technology of the time was not capable of operating them safely. • introduced the word horsepower to describe an engine’s power output. We now generally use watts to measure power, although engine power is still often rated in horsepower. • was the first person to propose that water is made of hydrogen combined with oxygen. • independently discovered the scientific concept of latent heat. 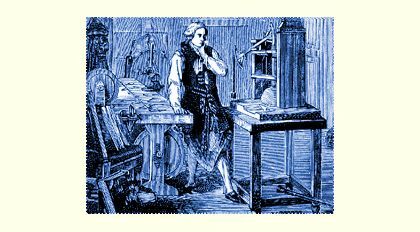 • invented the world’s first copying machine, similar in function to a photocopier, to make copies of correspondence, pages of books, and pictures. James Watt was born in 1736 in Greenock, Scotland, UK. He came from a successful family. His grandfather, Thomas, taught mathematics; his father, James, was a carpenter who built ships. His mother, Agnes Muirhead, was well-educated. She taught him to read, while his father taught him arithmetic and writing. James excelled at mathematics, science, and engineering at high school, but his language skills were less impressive. His health was often poor, and much of his learning took place at home, where he relaxed by watching fishing boats coming back into port and large sailing ships arriving with tobacco from the Americas. One day, thanks to his inventive mind, ships like these would be powered by engines rather than sails. At eighteen, following the death of his mother, and a ship sinking that placed a heavy financial burden on his family, James gave up his plans to go to university. Instead, he trained in London as a scientific instrument maker, specializing in mathematical and nautical instruments. Within two months, his skills were higher than others who had been in training for two years. His exceptional hand skills had previously been commented on by workers in his father’s shipyard in Greenock. After a year in London, he found work at Glasgow University repairing instruments for the astronomy department. Watt’s instrument work was so good that the university’s professors wanted to keep him working there permanently, so they invited him to set up a workshop in the university. They soon realized the young man in the workshop was remarkably intelligent. They began calling on him to discuss their work. Students of mathematics and physics found Watt had learned more about their subjects than they had. He also overcame his earlier poor language skills, teaching himself German and Italian in order to read more scientific literature. 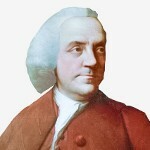 Watt became friends with Adam Smith, who founded the academic discipline of Economics and wrote The Wealth of Nations. He also became friends with the chemist Joseph Black, who discovered magnesium and, independently of Watt, invented the concept of latent heat. In 1759, four years after his arrival in Glasgow, the 23 year-old James Watt became interested in steam engines. This happened when another of his new friends at the university, Professor John Robinson, discussed with him the possibility of a steam-driven car. Although their ideas for a car were impractical, a seed was sown in Watt’s fertile mind. Professor Robinson didn’t stand still either. He was the first person to publish an inverse-square law for electric forces, and he invented the siren. In 1763, aged 27, Watt came into contact with a working steam engine, the Newcomen engine. Professor John Anderson, who demonstrated the engine in his physics classes, needed it repaired. Watt did the repair, but was astonished at how little work the engine was capable of. 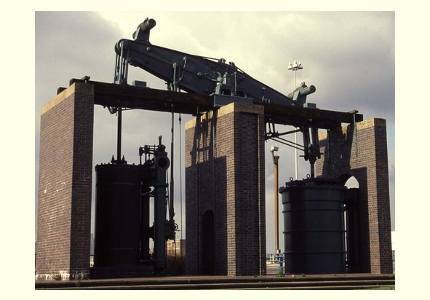 At that time, Newcomen engines had been used in Britain for 50 years, and no-one had found a way to improve them. They worked on the principle that a piston in a cylinder was driven in one direction by a jet of steam that heated air in the cylinder, expanding it; cold water would be injected in place of the steam to cool the air in the cylinder, creating a partial vacuum which pulled the piston back in the other direction, ready for the cycle to begin again with the injection of hot steam. Watt decided he could make a better engine. He thought about little else, and experimented in his workshop with water and steam in metal vessels. After two years of experimenting and thinking, Watt had his Eureka moment. With his scientific understanding of the behavior of water and the principle of latent heat, he realized that the problem with the Newcomen steam engine was as follows: heat was used by the engine to generate steam, but when the steam had done its work the cylinder was cooled down with water. Heating and cooling the same cylinder for every piston stroke was very costly in terms of the energy needed to do it. The idea came into my mind that as steam was a gas it would rush into a vacuum, and if I linked the engine’s cylinder to a vessel at low pressure, the steam would rush into it. The steam would condense there and it wouldn’t cool the engine-cylinder. I then saw that I must get rid of the condensed steam from the cylinder. Watt redesigned the engine. His idea was that air pressure would push the piston into a partial vacuum generated when steam condenses into liquid water. The steam turned into water in Watt’s condenser, which was surrounded by cold water. The process was helped by a vacuum pump connected to the condenser which took the hot water made by the condensing steam and conveyed it back, still hot, to the boiler ready to be turned back into steam. While keeping the condenser cold, Watt also realized the importance of keeping the piston/working cylinder hot: he surrounded these with a hot steam jacket. By the end of 1765, a 29 year-old Watt had built his first small-scale steam engine, featuring a separate condensing chamber, and a steam jacket. The start of industrial revolution was getting closer, but had not yet begun. In 1769, aged 33, Watt patented his new engine. A Boulton & Watt engine in Birmingham, England, built during Watt’s lifetime in 1817. Image by Chris Allen. Watt owned one of the most important patents in human history. He sold it to John Roebuck, whose factory went bankrupt. 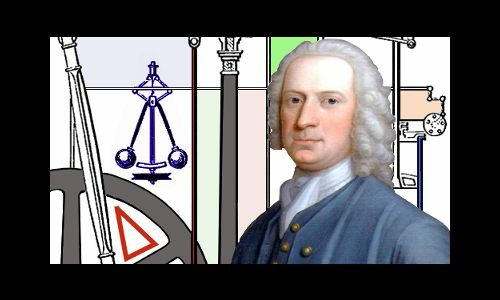 Matthew Boulton of Birmingham bought the patent rights to Watt’s steam engine. In 1775, Watt celebrated his 39th birthday and began a highly successful 25-year partnership with Boulton. The partnership was a perfect combination of Watt’s scientific and engineering ingenuity and Boulton’s factory and commercial skills. Eleven years after Watt built his first small-scale steam engine, his engines began to be installed to pump water out of mines. The annual fee the mine owners paid for the machines was one-third of the value of the fuel savings the machines made. News of the new super-efficient engines spread fast, and with the coming of Watt’s steam engines, the industrial revolution began. Watt and Boulton’s success did have a few hiccups along the way. In 1791, they had to arm their workers against a four day riot in which scientists and intellectuals were a specific target. As the years passed, Boulton & Watt engines found their way into ever more applications, and the United Kingdom was gripped by the industrial revolution. Boulton and Watt began exporting their new technology all over the world. The new industries began releasing larger amounts of carbon dioxide into the atmosphere than previous human actions had. This trend continues today. The End, But Not Before Another Crucial New Engine Design! In 1800, aged 64, and very wealthy, Watt retired. His patent had expired, and he and Matthew Boulton passed their partnership to their sons, James Watt Junior, and Matthew Robinson Boulton, who continued it successfully. Watt continued with research work in his retirement. He patented his copying machine, the double-action engine, the rotary engine, and the steam pressure indicator. The rotary engine was crucial, because it enabled engines to drive wheels rather than the simpler up-down pumping motion of earlier machines. James Watt died in 1819, aged 83. His mental power had not declined. His mind was razor sharp to the end. "James Watt." Famous Scientists. famousscientists.org. 14 Jul. 2014. Web.